The C1-C4 alkyl acetates discussed in this report include methyl acetate, ethyl acetate, n-propyl acetate, isopropyl acetate, n-butyl acetate, isobutyl acetate, and sec-butyl acetate. Ethyl and n-butyl acetates are the major markets for C1-C4 alkyl acetates, accounting for more than 80% of the total world consumption for C1-C4 alkyl acetates in 2018. Growth in demand for C1-C4 alkyl acetates varies by acetate and region. Surface coatings and printing inks account for most of the global C1-C4 alkyl acetates consumption; the exception is methyl acetate, which is used almost exclusively as a chemical intermediate in the manufacture of acetic anhydride. China accounts for about 60% of the world capacity for ethyl acetate and plans to increase capacity by about 20%. Capacity additions for ethyl acetate and n-butyl acetate in other regions are less significant. Western Europe and the United States represent smaller and more mature markets than China, with estimated growth rates of 1.0–2.0% per year for ethyl acetate and 1.0–2.0% per year for n-butyl acetate. 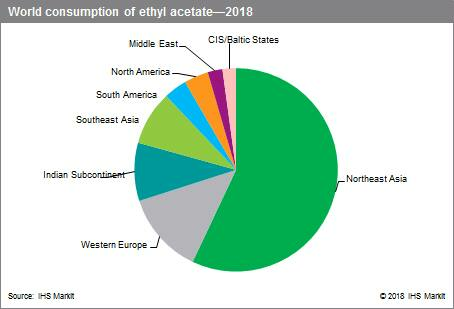 With the Middle East starting alkyl acetates production in 2013, regional ethyl acetate demand has improved, but the region will likely become a large exporter of the product. Most of the n-butyl acetate demand in the Middle East is satisfied by exports, although Sipchem has produced small volumes in its swing ethyl acetate/n-butyl acetate plant in Saudi Arabia since its first n-butyl acetate trial production in late 2017. India is a net exporter of ethyl acetate and a net importer of n-butyl acetate. The Indian market continues to grow, as it is expected to have strong growth in domestic consumption and exports during the forecast period. Demand for most downstream markets for C1-C4 alkyl acetates is greatly influenced by general economic conditions. Consumption of C1-C4 alkyl acetates in surface coatings depends heavily on construction/remodeling activity, automotive production and refinish activity, and original equipment manufacture (OEM). Demand for C1-C4 alkyl acetates in inks tends to be more recession-resistant, as most rotogravure and flexographic inks are used in publications and food and beverage packaging. Surface coating applications will continue to drive demand for alkyl acetates; this market accounted for slightly less than half of global consumption in 2018. Growing demand centers such as India and China will continue to drive global production. sec-Butyl acetate is a relatively new end use for acetic acid. China accounts for almost all of the nameplate capacity for this product in 2018. sec-Butyl acetate is used mainly for coatings, pesticides, and gasoline blending in China. This is a growing market in China and most production is consumed domestically. Southeast Asia, which includes Indonesia, Malaysia, Myanmar, the Philippines, Thailand, and Vietnam, as well as Australia and New Zealand, is an important region in terms of production and consumption of alkyl acetates. Ethyl and n-butyl acetate are the main C1-C4 alkyl acetates consumed in Southeast Asia. Indonesia, Vietnam, Thailand, and Malaysia have the largest demand for alkyl acetates, led mainly by surface coating applications, followed by inks. Total consumption of ethyl acetate in Indonesia has increased steadily in recent years because of continued strong domestic demand for printing inks, paint manufacturing, PVC film, pharmaceuticals, white glue, and other applications. Currently, there are more than 20 manufacturers of printing inks operating in Indonesia. Domestic demand for ethyl acetate in Indonesia is expected to increase continuously through 2023, with an above-average annual growth rate throughout the forecast period. Malaysian demand for ethyl acetate has been growing steadily; Thailand also continues to have strong growth in the consumption of ethyl acetate. In Vietnam, demand for adhesives has been increasing in recent years, reflecting the rise in shoe production in the country. Vietnamese ethyl acetate consumption increased at healthy rates during 2013–18. Southeast Asian consumption of ethyl acetate will continue to grow through 2023, driven mainly by surface coating applications. 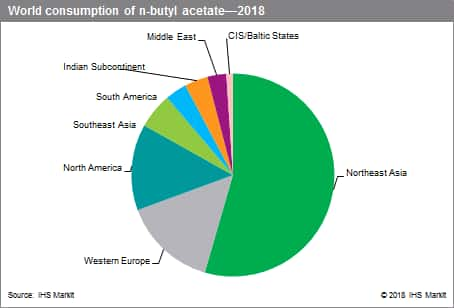 n-Butyl acetate consumption will grow in the region—albeit representing a smaller market.